The Children Act Review | Wanders into territory that is a bit problematic. "The early introduction of, and front-heavy concentration on, Fiona’s marital difficulties gives an indication of what type of movie Richard Eyre’s film is going to be." "In its second half, The Children Act wanders into territory that is a bit problematic." 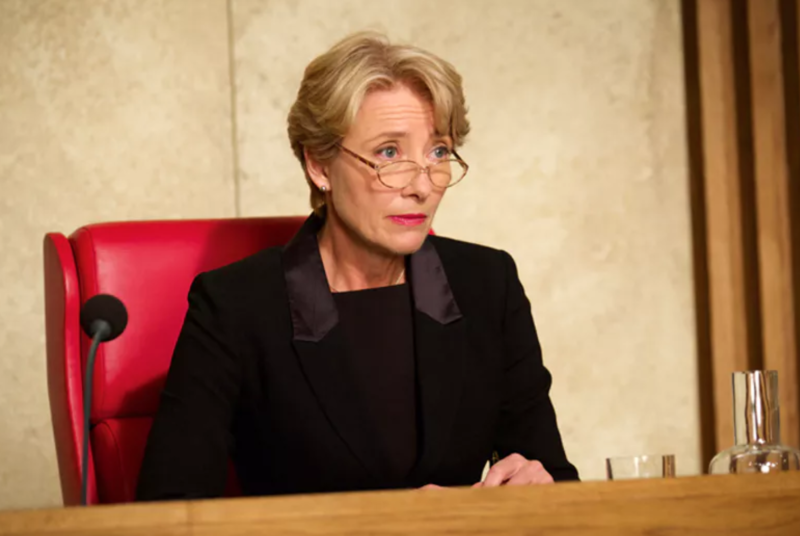 If Emma Thompson were portraying a crusading lawyer in The Children Act, one who was fighting either for or against the right of an underage Jehovah’s witness to refuse a life-saving blood transfusion, it would be easy to imagine the structure of that type of narrative. But Thompson plays the judge presiding over the case, lending the shades of grey that typically accompany weighing both sides of an issue. That impartiality has an interesting effect on the film’s narrative structure, which contains more than a few surprises and leaves some doubt about where everything is going. This is an invigorating wrinkle in the type of film that seems like it could be a telly movie – until the point that the unexpected decisions don’t bear satisfying fruit. A 17-year-old who is just a few months shy of making the legal case moot, Adam (Fionn Whitehead) isn’t going to die of his leukemia diagnosis. His religion allows him to seek treatment for cancer. What it doesn’t allow is to take the blood of another in his veins, and that’s what’s needed when the leukemia treatment prevents him from being able to create his own. Adam’s parents (Ben Chaplin and Eileen Walsh) have been such good Jehovah’s witnesses that they’ve made their son even more devout than they are. He’s ready to die, or so he says. They don’t want him to die, but they also don’t want him or them to be “disfellowshipped” from the religion that has defined them, whose defining principles they accept implicitly. The judge deciding the case, Fiona Maye (Thompson), has her own personal distractions to deal with. Her husband (Stanley Tucci) has announced he intends to have an affair, because it’s been 11 months to the day since they were intimate – but then still to return and stay happily married to her. He expects this pragmatic approach to infidelity will appeal to her innate sense of judiciousness, but it does not. Running astray of her usual professional instincts as a result of this emotional turmoil, Fiona decides she must visit Adam in the hospital to get a true sense of his capacity to understand that he might be sentencing himself to death. Childless herself, Fiona’s got more at stake in this interaction than she realises. The early introduction of, and front-heavy concentration on, Fiona’s marital difficulties gives an indication of what type of movie Richard Eyre’s film is going to be. If it were merely an issue-of-the-week movie, Ian McEwan’s script (based on his novel) would devote itself to issues central to the moral debate underpinning Adam’s case. We certainly get that as well, but we learn early on it’s not going to dominate the film. The less it does, the less likely we are to see where everything is going. The connection between the strain in Fiona’s relationship and the legal matter before her is not as fully developed as one would hope. There might be a message of “if you love something, set it free” in there, and certainly, the different ways it is possible to love a person, some of them counterintuitive, are explored by the film. The way these accumulate toward the film’s emotional climax are imperfect, though. The two main issues facing Fiona have a false equivalency that never fully reconciles. You have to applaud McEwan and Eyre for not making the kind of well-meaning message movie that The Children Act seems like it could be. It’s not as interested in topical issues like religious faith and the age of consent over one’s own medical treatment, as it is in how people think about those issues, and how those issues speak to other big issues that define their identities. They don’t always speak to one another in ways that work, but the attempt is appreciated. Legal and medical procedure are not the subjects of this movie; the human mind is. The film’s title has two, or I suppose three, meanings. Of course in the most obvious sense it’s referring to an act of government related to the welfare of children, but there’s also the sense of an underage person “acting” on his/her own behalf. Then you’ve got what “acting” means in the context of making films, though Fionn Whitehead as Adam – the film’s one performer who qualifies as a child in this context – is not the standout here. That would be Emma Thompson, who’s actually better in the small moments than the big ones. Adam at one point talks about the effect on him of watching her think, and indeed, Thompson thinks with the best of them. A cerebral actor gets the most out of a cerebral role. In its second half, The Children Act wanders into territory that is a bit problematic. In a way it’s a logical outgrowth of what has come earlier, and even if it weren’t, it’s an interesting way to branch off the narrative to prevent it from becoming conventional. Bold choices don’t always pay off, though, and there’s a bit of a sense of that as The Children Act winds down. Far better that than just a paint-by-numbers courtroom drama.